Senator Cantwell, a longtime supporter of truck, rail and port infrastructure, cites recent rail accidents in seeking a congressional review of Amtrak safety. Sen. Maria Cantwell, D-Wash., is seeking a congressional inquiry into Amtrak’s safety practices after Monday’s passenger-train crash near DuPont, Pierce County. “Millions of Americans depend on rail service each day, and businesses in every corner of our country depend on freight rail to keep commerce running. 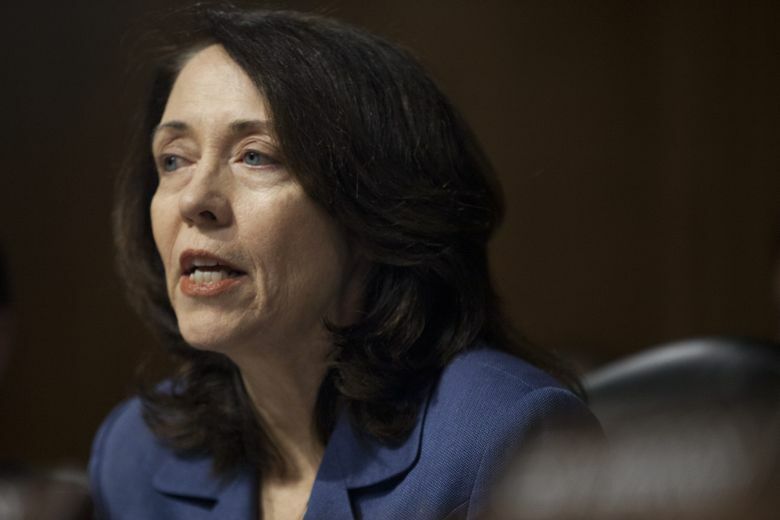 Therefore, the alarming rate of incidents on our rails is cause for tremendous concern,” Cantwell wrote in a letter Thursday to the Senate Commerce, Science and Transportation Committee. Cantwell, a longtime supporter of better truck, rail and port infrastructure, mentioned incidents that have killed a total of 46 people and injured 450 others — the 2008 Chatsworth, California, crash where a Metrolink train ran a stop signal and crashed into a freight train; two commuter-train crashes in New York City, and the 2015 Philadelphia-area crash where the engineer sped around a curve and the train derailed. An Amtrak train also derailed July 2 at Chambers Bay near Tacoma, without major injuries, when a track device deflected a train that missed a stop signal approaching a drawbridge. In addition, Cantwell and 14 other Democratic senators sent a letter to Secretary of Transportation Elaine Chao, calling on her to hold railroads accountable for failing to implement sufficient safety measures. The senators want a report on the status of a safety system called positive train control (PTC), satellite-based technology that can automatically slow or stop a train that’s speeding or approaching obstacles. Some experts have said PTC could have prevented the DuPont crash, which the National Transportation Safety Board (NTSB) said occurred when the train was going 80 mph into a curve posted at 30 mph. The system had been activated on that section of track. The senators signing on to the letter include Patty Murray of Washington, and Ron Wyde and Jeff Merkley of Oregon. The NTSB has recommended that railroads adopt PTC technology for more than 40 years, the senators’ letter said. “Since NTSB first recommended PTC, more than 300 people have died, thousands have been injured, and millions of dollars in property damages have been incurred,” the letter says. Monday’s derailment killed three people and injured dozens of other passengers and crew, including an engineer and conductor in the lead locomotive. Cantwell said she’s been focused more on oil-train safety, because of the potential for explosions. But this week’s tragedy shows the need to oversee passenger trains. “We need excellent, safe Amtrak service on the West Coast. We need someone to tell us what it takes to get that,” she said in an interview. Since the 2008 California crash, Congress has sporadically debated and contributed money toward PTC. Congress originally set a 2015 deadline for railroads to implement the system, but later extended that deadline to Dec. 31, 2018. In Washington state, the costly technology has recently been activated on BNSF Railway freight trains, though Cantwell said she’s not sure if it’s fully functioning. The system is being tested on Amtrak trains and is scheduled to go live next year. Most of Sound Transit’s commuter trains are equipped and certified to use PTC, and the system activates 56 percent of the time, during a difficult startup phase. But Cantwell said the hearings should cover broader questions — to ensure safety regardless of whether PTC exists. Safety issues often debated in the rail industry include whether crew training and staffing levels are adequate, the condition of aging U.S. rail infrastructure, and operating patterns through communities that grow or change. 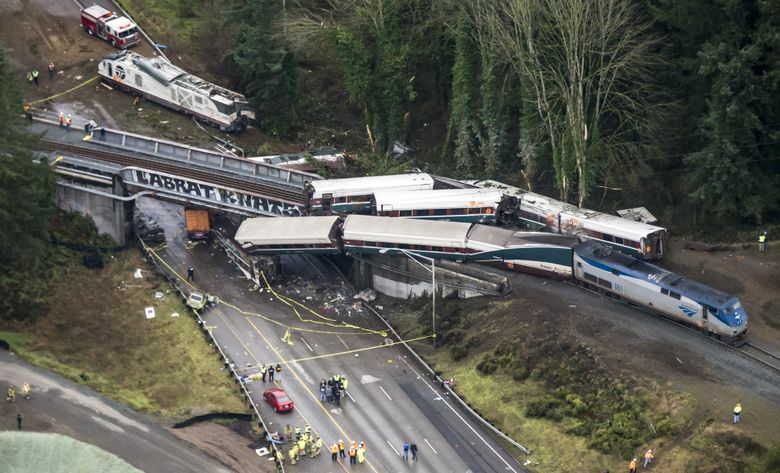 Amtrak Cascades 501 was on its inaugural trip through a passenger corridor south of Tacoma when the crash occurred. It derailed while approaching a curve and railroad trestle built in 1910, used historically for lower-speed freight and passenger lines, and recently upgraded with new rails. That trackway is owned by Sound Transit, while Cascades trains are owned and overseen by the Washington State Department of Transportation. The passenger service is operated by Amtrak. Cantwell asked for an oversight hearing in January, in her letter to Sen. John Thune, R-South Dakota, who chairs the committee, and ranking member Bill Nelson, D-Fla.